The PowerLogic™ PM5000 power meter is the ideal fit for cost management applications. The PM5000 (5100, 5300, 5560 series) provides the measurement capabilities needed to allocate energy usage, perform tenant metering and sub-billing, pin-point energy savings, optimize equipment efficiency and utilization, and perform a high level assessment of the power quality of the electrical network. In a single 96 x 96 mm unit, with a graphical display, all three phases, neutral and ground can be monitored simultaneously. The bright, anti-glare display features large characters and powerful backlighting for easy reading even in extreme lighting conditions and viewing angles. Easy to understand menus, text in 8 selectable languages, icons and graphics create a friendly environment to learn about your electrical network. Highly accurate devices with global billing certifications. Cost management: Cost saving opportunities becomes clear once you understand how and when your facility uses electricity. Sub billing / tenant metering: allows a landlord, property management firm, condominium association, homeowners association, or other multi-tenant property to bill tenants for individual measured utility (electricity) usage. MID approved meters for billing applications across Europe. Cost allocation: allocate energy costs between different departments (HVAC, indoor and outdoor lighting, refrigeration, etc. ), different parts of an industrial process or different cost centres. Cost allocation systems can help you save money by making changes to your operation, better maintaining your equipment, taking advantage of pricing fluctuations, and managing your demand. Network management: Improving reliability of the electrical network is key for success in any business. Monitoring values such as voltage levels, harmonic distortion and voltage unbalance will help you to ensure proper operation and maintenance of your electrical network and equipment. 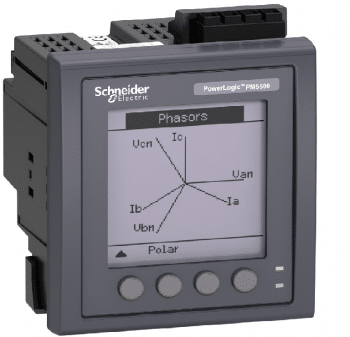 Basic Power Quality monitoring: power quality phenomena can cause undesirable effects such as heating in transformers, capacitors, motors, generators and disoperation of electronic equipment and protection devices. Min/ Max monitoring (with timestamp): understanding when electrical parameters, such as voltage, current and power demand, reach maximum and minimum values will give you the insight to correctly maintain your electrical network and assure equipment will not be damaged. Alarming: alarms help you to be aware of any abnormal behaviour on the electrical network in the moment it happens. WAGES monitoring: take advantage of the input metering on PM5000 meters to integrate measurements from 3rd party devices such as water, air, gas, electricity or steam, meters.